Dr. Michael Allen, in his book ‘Designing Successful E-Learning’, challenges us to forget about instructional design and do something interesting. Forget about instructional design? The irony is that few people care more about instructional design than Dr. Allen, – as I have personally observed. But all too often the methodical analysis of learners and the fussing over learning objectives and assessment items does not translate into – to use Dr. Allen’s words – a meaningful, memorable and motivational experience for online learners. “Do something interesting’. Aye, there’s the rub. ‘Something interesting’ is the point of intersection between course and student. It is the thing that engages students and makes learning meaningful to them. It is the activity, the ‘doing something’ that brings students a step closer to the application of their new knowledge to a world beyond the scope of their course. Of course, in this context, to do something interesting is to truly understand learner needs and learner constraints, establish meaningful and measurable goals, produce assessments that will help determine student progress toward those goals and to engage students in an interesting, meaningful activity that will advance them towards goal attainment. This is the ‘active learning’ that everyone is talking about – and it is totally achievable in an online setting. It is the practice of hands-on, minds-on that Dee Fink describes in his ‘Creating Significant Learning Experiences.’ Quality assurance rubrics and online learning development processes pay a lot of attention to analysis, goal definition, and assessments. All of that design work is essential. But the online activity is what engages students. It bears weight disproportionate to that which is typically assigned to it in the quality assurance rubrics. Too much of online learning attempts to engage students through the worn-out pattern of reading assignment, discussion, quiz, and high stakes assessments at the conclusion of the course. Too many students still lament that online learning is boring…albeit convenient or necessary to complete a program requirement. To make online learning interesting, instructors need a strong skill set. They not only need content knowledge, interpersonal communications, and a design methodology, but they need to construct or supervise the construction of new media. Media plays a huge role in online learning. It serves to motivate, provide information, check for understanding, challenge students to recognize conceptual patterns, and to think deeper. Instructors are in a new world. It is a media-rich world. The online learning setting requires much more from media than its basic delivery of information. It must engage students…it must help students to know, to reflect, and to think critically. As Richard Mayer has pointed out in his research and his book ‘Multimedia Learning’, the successful use of media helps to reduce cognitive overload, emphasize important concepts, and prepare students for difficult material. Everything counts: the amount of text, what is highlighted, how images are used, how audio is used, and so forth. As important is the type of activity chosen to support a specific learning outcome. Patricia Smith and Tillman Ragan expand on that concept in their book “Instructional Design”, which is now in its 3rd edition. This is the book that had the biggest impact on me in the early 90s. It was one thing to understand the cognitive learning outcomes that Benjamin Bloom categorized in the 50s. It was quite another, to produce activities that supported those outcomes and to do it online. Dee Fink, in his integrated approach to designing college courses, writes about the analysis of situational factors. Before that, Smith and Ragan wrote about analyzing the learning context, the learners and the learner task. And before that, Bloom wrote about human characteristics and school learning. And before that… But once you understand the subject matter, the learner and the learning outcome, what then? The activity is the thing that will catch the conscience of the king. In this case, the student is king. Ideally, an activity is an instructional strategy. There are strategies that are particularly well suited for each type of learning outcome. As Smith and Ragan describe in “Instructional Design”, there are strategies well suited to declarative knowledge and other strategies suited to other types of knowledge promoted by concept lessons, rule lessons, and problem-solving lessons. Some of these strategies require some technical expertise on the part of the instructor or the help of a good third party eLearning authoring tool. Other strategies are simple to deploy. For example, let’s focus on activities that use strategies for declarative knowledge. Instructors may ask students to write a list recalling all of the terms used in a reading assignment. Or they may ask students to pair off and share. This is low tech, but it helps students to focus on the information and to recall the reading. This, in turn, helps to reduce the cognitive load on the student when encountering the same terms in a discussion of concepts or procedures. Similarly, in an online discussion, students can interview one another on terms they didn’t understand. Or submit a short summary of the reading to the online drop box. A slightly more technical approach might be to set up a variable interval queue that challenges students to define the terms. Missed terms get returned to the queue at variable intervals; correct terms get removed. Perhaps, a simple set of flashcards. Missed items get returned to the deck. 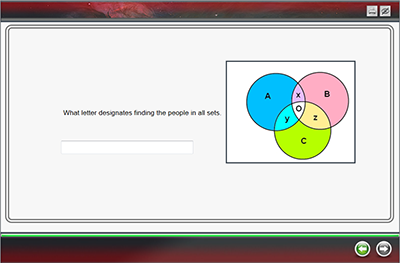 Correctly answered items get removed. 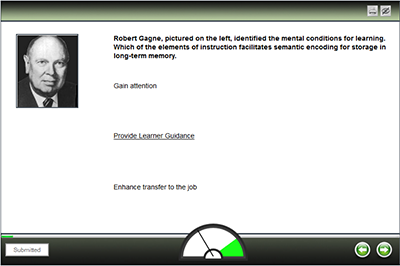 The tech approach requires the help of a tool that makes it easy for instructors to set up variable interval queues or flashcards without needing to write a computer program. Now let’s move on to the next act. In strategies for concept lessons, instructors might present a textual description of an economic practice, for example, where the characteristics of state socialism are clear-cut and simple to discriminate such as Bismarck’s Germany. The next description can be a more highly nuanced examination of state socialism as it is practiced in modern countries such as Britain after World War II. Students are given the facts and must decide – is this an example or a non-example. The student activity of analyzing an example and making a decision helps the student to recall information, categorize, separate important information from non-important information and then make a commitment, which leads to affirmation or a potentially useful mental condition: cognitive dissonance. 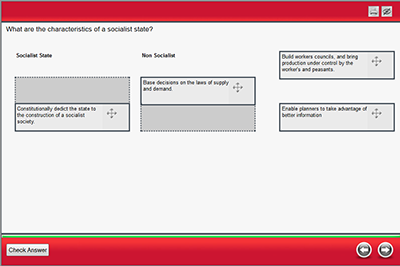 A slightly more technical approach might be to provide random examples of economic practices and ask students to drag the examples into one of two categories, one of which is state socialism. As the students advance, the examples get more and more nuanced. Students must learn to discriminate between examples (vis–à–vis the concept), but not over-generalize. The challenge can be perceived as a game that rises in difficulty and requires the student to be more sophisticated in his or her categorizations. In strategies for problem-solving lessons, instructors can use case studies. Beyond the cognitive ability of constructing or selecting cases, the instructor simply needs to know how to type. Low technical requirement. The case studies can lead to straight forward problem solutions or they can increase in difficulty to represent what we find in real-life. The technical approach might be the decision-making scenario. Students are presented with information, incrementally. Based on the information and their knowledge, they must make choices. The choices generate instructive feedback then the program optionally branches into different parts of the scenario based on student performance. Whether low tech or high tech, students benefit from activities that keep them interested and promote their learning. In summary I am strongly encouraged by instructors who are deliberate about the design of their courses. I am encouraged by their thoughtful analysis of the situational factors, the learning outcomes they intend for their students, and the alignment between assessments, outcomes and activities. To engage students, I encourage a matching of learning outcomes to activities that employ effective instructional strategies. In all of the learning outcome categories, instructors have non-technical and technical options to generate activities. Technical options often require special tools in the form of add ons to the learning management systems or third-party tools. Easy-to-use tools help broaden the instructor’s choice in the strategies he or she can employ in online courses. The possibilities are not limited by lack of technical knowledge but broadened to include strategies that are effective, meaningful and motivational to students. This is what personally drives me to continue working on such tools – to help instructors and students realize the learning opportunities that online learning affords them, and to make it…well…interesting. Smith, P. L., & Ragan, T. J. (2005).Instructional design (3rd ed.). Hoboken, N.J.: J. Wiley & Sons.